The looks you craft in your home represent your unique personal style. At Dea Fine Linens, we offer custom design color choices and patterns that allow you to select sheets, towels and more that wonderfully complement your décor. We’re here whenever you’re looking for bright ideas to reinvent or refresh your bedrooms or bathrooms with beautiful designs in perfect colors. To lean more about our custom services, please visit this page. Dea is proud to be featured in the current works of two of Palm Beach’s most impressive interior designers. Jennifer Garrigues has created a bold exploration of exotic colors and patterns in the bedroom in her collection at the Kips Bay Decorator Show House Palm Beach. And it’s complemented by Novella bedding, exclusively from Dea and featuring modern and classic embroidery options. Jennifer Garrigues takes exotic colors and patterns, with Novella bedding exclusively from Dea, and creates a lovely, comforting room. 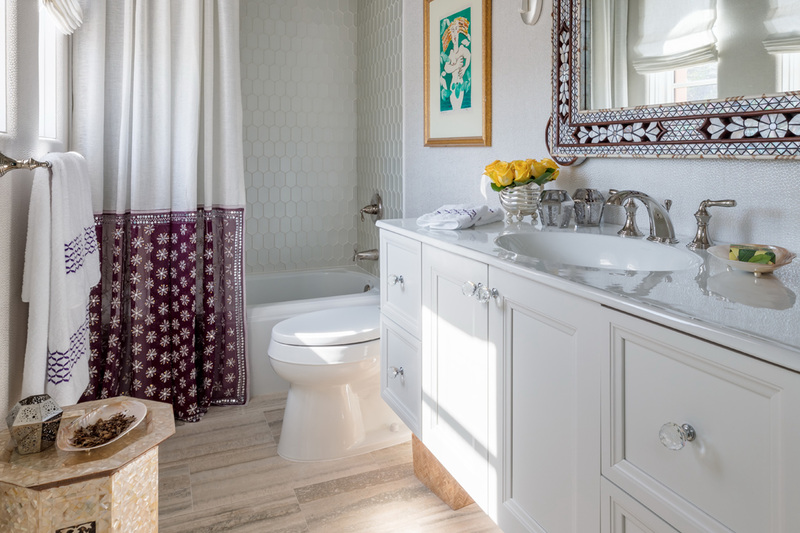 Bathroom design by Jennifer Garrigues also features Novella towels from Dea. Designer David Mitchell Brown envisions a modern luxury bedroom build around Dea exquisite Panama sheets. How will you make your own style statement? We invite you to visit the Dea gallery to see more ideas that can conveniently be customized with embroidery and custom colors that perfectly match your personal style. Please visit our Custom Services page, call (561) 366-1203 or contact us if you would like any more information, or stop in at our showroom! All pictures © 2019 Nickolas Sargent, courtesy of Jennifer Garrigues, Inc. and David Mitchell Brown.